Mr Doug N Daft has recently taken over as chairman and chief executive officer of The Coca-Cola Company. I have written the following letter to him in Atlanta, Georgia. May I wish you a happy tenure of office as head of the Coca-Cola Company. I am a great fan of the Coca-Cola drink. But there is a serious matter concerning one of your other products, Fanta, which I'd appreciate your addressing and getting back to me about. 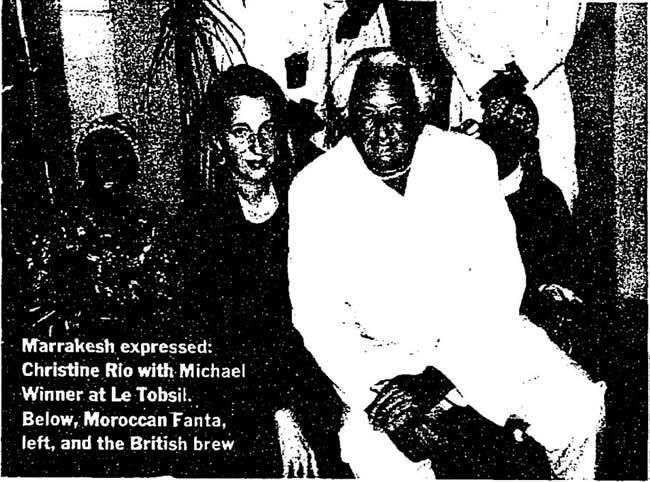 I never drank Fanta until a few years ago when I was poolside at La Mamounia hotel in Marrakesh, Morocco. I can thoroughly recommend this place to you, if you get time off. I ordered a fizzy Fanta orange and it was a complete delight: a lovely, bright-orange colour, a rich flavour, most refreshing. I don't know why it took me so long, but some weeks ago, I decided this was a holiday taste I could also enjoy in my home town of London, England. I therefore dispatched one of my beautiful receptionists into the hurly-burly of our local high street and she came back with cans of Fanta orange. These were adorned with your company's artwork, only different in that the English version displayed a fetching colour depiction of an orange cut in half, which was absent from the bottle I had so enjoyed in Morocco. The implication was that the British drink would be even more "orangey". You can see from the enclosed photograph how totally different is the colour of the two drinks. Whereas the Moroccan Fanta is a wonderfully bright orange, the London version is a weak, nasty yellow. It neither looks nor tastes like anything orange at all. Just as the Moroccan one is delightful, the British version is horrible. I sampled it and could not believe the difference. How could it possibly be, I wondered unhappily, that the same-named drink, the same logo, the same liquidity, could be a valued taste experience in one country and something so much less in another? Various reasons flashed through my mind. Did your predecessor Mr M Douglas Ivester have a secret hatred of the British? Did he have a Moroccan wife, lover or some other connection with that tine country that led him to ensure they had a superb product and we got something so inferior? How could two products, supposedly the same, be offered to customers when they are so different? I can no longer keep my concerns to myself. As well as sending you this photograph, which dramatically demonstrates the difference. I am having it published in The Sunday Times in London, a fearless and crusading journal that has brought to light many matters of high significance. We all of us here await your response with devout anticipation. My kindest regards to you and Mrs Daft. Yours sincerely, Michael Winner MA (Cantab). PS: Do you not think you should take the very next plane to Casablanca and thence travel westwards to Marrakesh to sort this out? If you do proceed on such a journey, may I recommend you have dinner at Le Tobsil, undoubtedly the best restaurant in Marrakesh. It's owned by a French lady named Christine Rio. She walks round her candlelit mansion in the old city in a black frock coat and trousers. The restaurant is the balconied inner courtyard, where a roof has now been added. The tables are large and placed well apart, with rose petals on the white tablecloths. It's truly romantic. Get Mrs Daft a bottle of Medallion Cabernet 1994, a very soft Moroccan wine. I'm sure she'll enjoy it. There's a log fire and two musicians chanting and playing stringed instruments. I had more than one meal there with Miss Lid the Third. No time to explain about her, Doug, old chap. We both loved the Moroccan salad of sweetbreads. puree of aubergine, sweet tomatoes, and more. Then there's spinach pie in crisp flaky pastry, pigeon without bones served with a magical sauce, lamb with tangerine, vegetable couscous and, for dessert, pear and oranges with grapes and almonds in a sauce, or almond tart - and, to finish, remarkable mint tea. Very fresh and real. When you leave, you go down alleys that have remained unchanged for centuries. There are barefoot kids, cats scattering as you walk. Chanting of the Koran can be heard from an ornately carved doorway. It's real Arabian Nights stuff Then you can take a horse and carriage back to La Mamounia and arrange to meet your forensic team by the pool to analyse Fanta. Mrs Daft can wander through the orange and grapefruit groves that edge the pool, and if she wants a carpet, let me know. I can get her an enormous discount. Michael Winner should consider himself lucky to have received a warm welcome at the Sir Charles Napier (Style, March 12). On one occasion, I took my young son along, having rung ahead to make sure it was okay. When we arrived, however, they placed him on a separate table away from our party, so I then had to sit with him. Why tell us on the phone that it was a family restaurant, then do nothing to accommodate us in an appropriate way? The food, by the way, was awful and we left early. When I rang to complain, they didn't give a hoot. Many pub restaurants outside London seem unable to decide whether they are really restaurants or simply pubs that run to more than just scampi and chips; too often they compromise by having pub service, decor and food, but restaurant prices. From my experience, the Sir Charles Napier sadly falls into this unhappy category. Getting room service breakfast seems to be a challenge, even in some of the world's best hotels. I've had boiled eggs delivered without egg cups, empty condiment containers, coffee instead of tea, solid poached eggs, cooked meals that have been ice cold - and I've been told that my breakfast order has been lost more times than I can remember. I now regard getting breakfast in my room as a sort of lottery. Perhaps Winner's Dinners could be replaced by an occasional column called Bazza's Breakfasts. I share the experience of some of your recent correspondents regarding tea at the Savoy. It is sad that this once great institution is going down the drain. I wrote complaining of the poor fare offered for the £19 set price. The reply from the management revealed a skin as thick as the sliced bread in their sandwiches and an attitude as lacking in interest as the appearance of their pastries. From the moment I picked up Michael Winner's book of Winner's Dinners to the moment I put it down, I could not stop laughing. Some day I intend reading it.